For those who trudge through large excel files trying to find / categorize data, know that depending on what you want to do, and the timeframe you have to do it in, it can be quite the daunting task. Why mesh SQL with Excel? 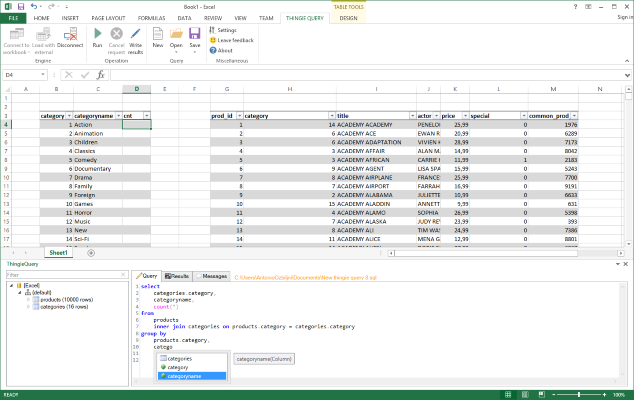 Although Excel is an extremely powerful tool with an intuitive and powerful user interface, it’s reliance on the GUI makes it less flexible than a scripting environment. Many of the operations that come naturally to people accustomed to working with SQL are downright difficult to do in Excel (e.g. table joins). With SQL you can manipulate data in a much more expressive way. And, since you already know SQL, the learning curve for ThingieQuery is almost nonexistent. Also, scripting allows you to easily automate a set of data manipulations, and to share your scripts with others. Excel does have its own mechanism for automating work, like VBA and recorded macros, but these tend to focus on cells in Excel rather than on the tables and data, and can be tedious, clumsy and frail when used for such purposes. Moving a table or adding a column can easily break such scripts if extra care is not taken. Is it for everyone? Not quite. You need to know SQL syntax. However, if you do know basic SQL syntax (and it’s quite easy to learn, mind you) you should feel right at home. In any event, we thought it was a nifty integration! Thanks for a great plugin Antonio – It’s quite useful!